I have a secret to reveal: I arranged to adopt a family from overseas. I offered to let them live with me. My wife wasn’t too happy when I told her. We’d have a lot less room in the house. She was even more upset when I told her how much it cost me to bring them here. I thought it was a good deal, actually. To have them at my service, year round? It was a no brainer. I brokered the deal through a man one province over, in Quebec, who had brought in multiple families in the past. He said the family would be arriving by boat, and would travel in a shipping container. I found this mode of transportation odd, but didn’t question the man’s motives–he claimed the deal was completely legal. I trusted him. I got word of the family’s safe arrival in the Montreal harbour, and arranged pickup through a good friend in the Ontario pinball community. Forty-eight hours later, the family arrived at my home for the first time. The Addams Family now lives in my basement, and I don’t ever want them to leave. The above paragraph outlines my acquisition of an Addams Family pinball machine through the re-import process: it arrived by boat from Bari, Italy on the Adriatic Sea, across the Atlantic Ocean, down the historic St. Lawrence Seaway into the port of Montreal and finally by land down Highway 401 to my home in the Greater Toronto Area. I rolled the dice on this machine, buying sight unseen through pictures only, and, in my opinion, won. The game arrived as described and has worked 100% since its arrival. Others have not been so lucky with these so-called “re-imports” (also known as “container pins” in these parts) sent over in massive shipping containers from across the ocean. They arrive mainly from Europe, Northern Africa and, in some rare instances, South America. It is an approach to collecting machines that made sense at one time for North American collectors, however due to the recent climate of the pinball market in the U.S. and Canada, it has been less attractive, both financially and logistically. A line of Stern games in an Italian warehouse, waiting for buyers. Besides the incredible hassle of brokering a multi-national deal for the purposes of obtaining an amusement machine, there seems to be, in Canada anyhow, an incredible stigma associated with games that are re-imported to North America from overseas. The games are almost always treated as second class units. Many of the For Sale threads on our local forums will state explicitly “North American machine, not a re-import”, to add credibility. 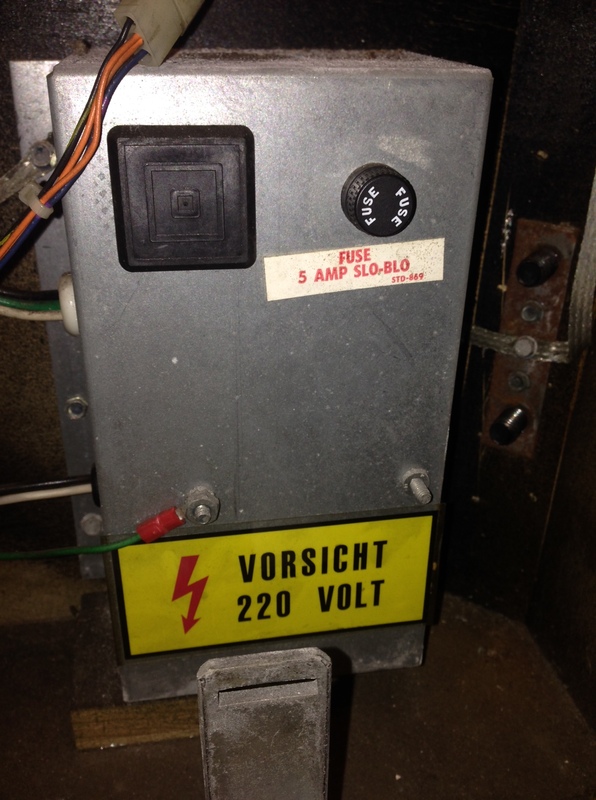 If it is not mentioned, given the number of re-imports on Canadian soil, Canuck collectors have been trained to ask the provenance of the machine or at very least perform a visual inspection of the machine to look for any sign of the letter “I” in the serial number, coin slot configuration, 220V stickers or country names that would explicitly mark it as a re-import. Collectors paint all foreign pinball operators as untrained hacks that “fix” machines with improper tools and parts. There is also the line of thinking that says the overseas machines are subjected to much more abuse than their North American counterparts. With many of the European machines being operated in bars and coffee shops throughout their life, there is the thought that they would be subjected to longer time spent on route, massive amounts of play upon them, little maintenance upkeep and a greater risk of beverages being spilt upon them. European operators have the reputation of trying to squeeze every cent they can out of their investment, riding the machines hard, and, given the beverages spilt upon them, putting them away wet. Some developing countries have been known to operate their machines out-of-doors, so there is a fear of finding those turn up in a container as well. In reality though, a routed game is a routed game, no matter if it comes off of a route in Buffalo, New York or Hamburg, Germany. North America has its fair share of hack operators that substitute a wad of tinfoil for a 4 amp fuse, too, not just the ones working overseas. For some reason, collectors are under the impression that just because a game has been brought back through a European wholesaler, it is automatically a basket case that has been played within an inch of its life, complete with hidden issues and unfathomable hacks. Granted, many do arrive on North American soil in pretty awful shape, however, I would argue games in similar condition existed in North America at one time as well, but due to the incredible demand for pinball machines here it has driven these basket cases to be completely restored by capable collectors or pieced out as donor machines. In my opinion, a game should be evaluated on the way it plays and its overall appearance rather than the addition of a letter or two in its serial number, or 110 extra volts. 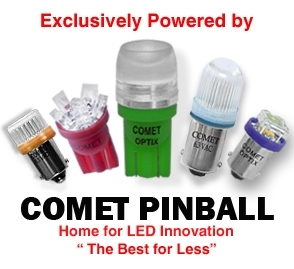 I actively follow the restorations performed by Chris Hutchins of High End Pins on his website. He provides clients and enthusiasts alike with before, during and after photographs of the games he works on, showing the meticulous care he takes in bringing the shine back to a machine. For nearly every game he brings back to showroom quality, Mr. Hutchins reprints the serial number decals as part of the restoration process. On one Addams Family restoration in particular, which I was able to peg from the outset as re-import game, Mr. Hutchins, at what I would assume was his client’s request, erased all markings of the game being a re-import. 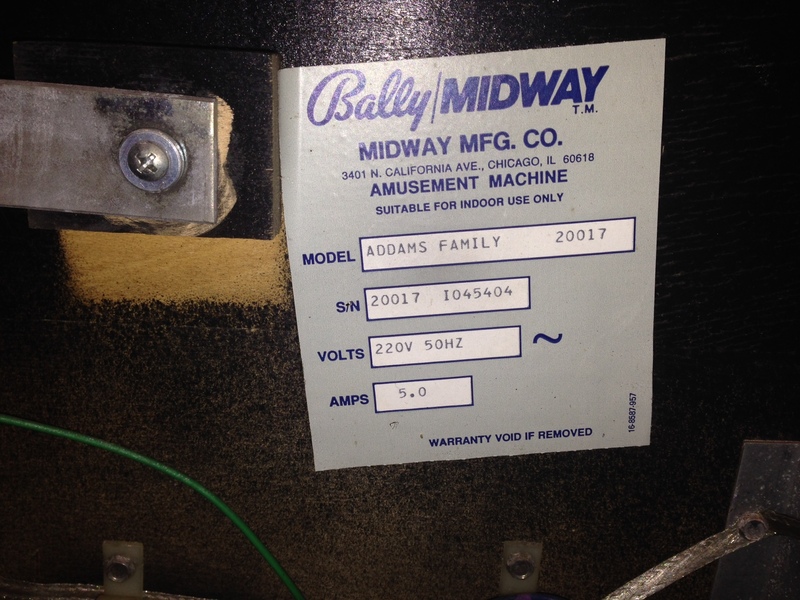 The coin door was changed to the North American two-slot standard, the European stickers that reference 220V were removed, and, when reprinting the serial number stickers, the “I”, which would have categorically marked the Addams as an original overseas export, was completely eliminated from all of the reproduction stickers. Thus, the stigma of the “re-import” ran so deep that this particular collector wanted the machine to look as if it never left the confines of North America. Did that “I” act as a scarlet letter for the collector? Did he not want his high end Addams Family restoration to bear the markings of a re-import game? This isn’t a common practice for Mr. Hutchins: the majority of the games he restores will transcribe the official serial number onto new stickers–digit-for-digit and letter-for-letter. This was obviously a special case. In the end, who cares, really? It’s the collector’s game. He’s paying for the high end restore; he can do as he wishes with it…even if it involves monkeying with a historical document such as a serial number. I think this just proves that the community devalues games that have spent time on foreign soil. So why import these machines in the first place if people approach them with so much trepidation? It boils down to a ravenous desire for a particular title (sometimes any title at all) at the right price. I only considered buying my Addams Family from overseas after about a year of not being able to find one in reasonable condition at a reasonable price here in Canada. [Ed. Note: Seriously…12,000 production games, and I couldn’t find a single damn one for sale here!] The lure of a deal will bring any collector to his/her knees. To be completely transparent with the bottom line on my container game, after all was said and done, I have $3900CAD into my Addams Family. The desire to get my hands on one drove me to this avenue, and it could have turned out much, much worse than it did. However, that is the risk you run buying a machine you have not played before purchasing and viewed only through a handful of pictures halfway across the world. In looking at the price lists available from the Italian wholesaler we worked with, “deals” on re-imports are few and far between, and if they are there, they will only be available on “A-List” titles that have rocketed in value on this side of the continent: Twilight Zone, Cirqus Voltare, The Addams Family, Tales of the Arabian Nights, and so forth. One must also think about landing a container in North America and the charges associated, which will also wreak havoc on your bottom line. After the numbers have been crunched and you find you can save a thousand or so dollars on a desirable machine, you still have to get past the idea of taking on a considerable amount of risk. An Italian Monster Bash, with a pretty bashed cabinet. A lot of the risk comes from the possibility that the game is misrepresented in pictures or the description. And the possibility that the machine was in fact operated just as horribly as the community assumes they were operated. It is almost impossible to capture the essence of a machine by looking at five general pictures of it, and that is really all you’ll get from many overseas wholesalers. We collectors can be faulted a bit too, expecting perfection from a machine that had a bargain basement price tag. Descriptions of the games are often vague and include lingo that is completely lost in translation. One popular term the Italians liked to use in the lists we received was “invisible wear on playfield”. What does this even mean? Do they mean “visible” wear? Do they mean wear that can hardly be seen? Games have been known to show up utterly filthy, reeking of stale smoke, water damaged, corroded, or missing parts/boards. There is a fabled story in the Canadian pinball community, which I cannot confirm or deny, that a certain Canadian retailer is known to import pinball machines from Algeria, a North African country on the Mediterranean, which are sold to collectors who end up finding that the machines are still filled with sand from the country’s vast desert landscape. Finding a reliable overseas contact is key when setting up a container deal. Just as we have saints and scumbags who sell machines here in North America, so it goes with wholesalers overseas. A shipping container’s worth of Italian pinball machines destined for Canada, packed and ready to load. I asked a fellow collector from the Toronto pinball community, Adriano Jorge (also known as Drano on Pinside), to offer his thoughts on the idea of buying container games. He’s one of the more seasoned experts, having bought a handful of games from our Italian source. “From the moment I started collecting pinball machines, “container” or re-imported games were always something to be wary of. As I got more comfortable repairing and restoring machines, they started becoming a tempting source of inexpensive projects, especially in our relatively small Canadian market. But, who among us had tens of thousands of dollars to speculate on a container full of machines? When a local collector started organizing group funded shipments, I had to look again. And, when that same source started offering titles such as Cactus Canyon, I was hooked. Cactus Canyon was/is my holy grail of restoration projects. So, I sold my restored Twilight Zone and ran, cash in hand, to try my luck. With shipping costs and taxes covered in the price of the machine, all I had to do was get it transported to my door. I was expecting pure horror. My expectations were fairly low after hearing some experience a others had with their “gaucho games”. In the end, I was lucky. The Cactus Canyon arrived filthy with a terrible cabinet…but otherwise working with minimal playfield damage. It was a perfect restoration candidate. Each month a new list was available… some with rarely seen titles like a Zaccaria Farfalla… which ended up being my next container purchase. After building a small rapport with this Canadian importer, I started getting an early peek at incoming games. Many were wrecks, but a few real gems were mixed in. I finally decided to try a bulk buy and committed to three more games (Fish Tales, Tales of the Arabian Nights, High Speed), while also coordinating transport for other local buyers and their games [Ed. note: I was one of these local buyers, and the TAF came over in this shipment]. It was here that I got to see the diversity of container pin buyers. Some were like me, capable of cleaning up a game or performing simple repairs, ready to deal with issues. Others, were wide-eyed new enthusiasts trying to get into this increasingly expensive hobby and praying for the best. Container buys as I know them in Canada, and as Mr. Jorge has outlined above, are done on a group basis. A member of the pinball community in Quebec receives a list of games available from his contact in Italy which he distributes to anyone interested through our Canadian forums. He acts as organizer and middle-man. Pictures of the games are normally included, and can either be a detailed set including close-ups, or simply a shot of the machine lying on the floor with no legs. Our organizer crunches the numbers and attaches a bottom line price, in Canadian dollars, for each game which includes freight, import taxes and probably a cut for himself. The organizer has certain requirements he has to fill-—he can’t just load up a container full of Addams Families and Twilight Zones. He has to buy some of the lower echelon titles as well. Percentages, I assume, are set by the Italian seller. I’m sure they don’t want to be stuck with a warehouse full of Diamond Ladys and Cactus Jacks; they want to spread their A-Listers out to help move the undesirable trash. If the quotas are met, full payment is sent to our organizer and the wait begins for the boat to arrive on Canadian soil and clear customs. A link is sent out to the participants so the freighter can be tracked via satellite as it travels across the ocean. Once the game arrives, transport from the organizer’s facility outside of Montreal is the responsibility of the buyer. There have been disappointments for individual collectors within our community from these group buys. One instance saw a collector lift the playfield of his re-import Doctor Who to find each and every mechanism, bracket and stand-off rusted beyond repair, which would indicate that the game was on location, or in storage, at or near a seaside town where the salt water would accelerate the oxidization process. Thankfully, this collector was able to exchange the “Doctor Rust” machine for a different title on a future shipment. Another collector saw a Cirqus Voltare arrive incomplete, with unique playfield parts and mechanisms completely missing from the game. It was sold at a loss by this collector, as he didn’t have the time or patience for such a project and, further, was completely crest-fallen with his failed “re-import” score and wished to wash his hands of it. These two cases I have mentioned are extreme, and are probably a result from lack of information and proper photos by the wholesaler. They are tales that should give buyers pause, and depict just how risky buying from overseas can be. For every gem, there are an equal number of turds. I’d like to talk a little about my personal experience that I touched on at the outset of the article. Our Italian wholesaler had five-plus Addams Family machines on their list. Nearly all had burns in the magnet area, a couple were missing the topper, and some had completely trashed cabinets. The price difference between all of the machines varied by only $1000CDN. Not willing to take a chance on a bucket of bolts, I figured the most expensive one was probably the one in the best condition. 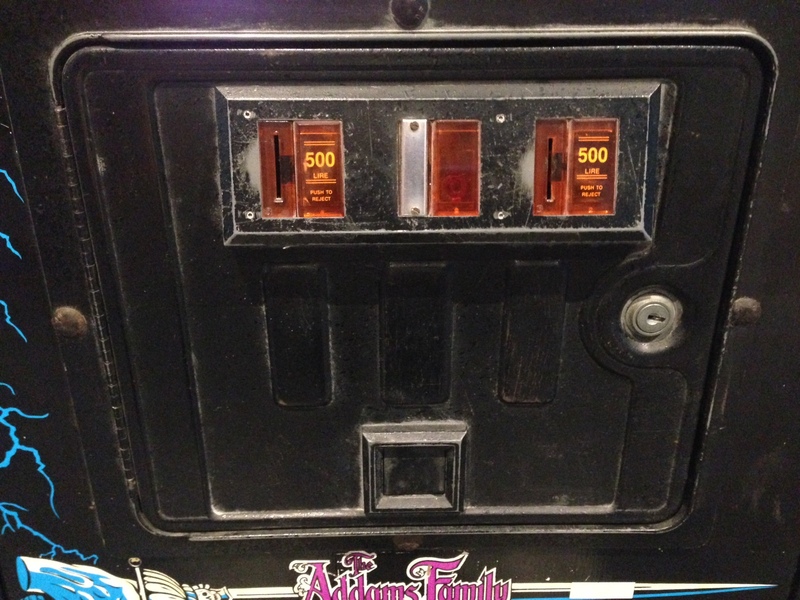 Another positive indicator was that this highest priced machine had over twenty pictures available for viewing: both sides of the cabinet, areas with slight wear, under the playfield, behind the backglass, in the Thing Box and everywhere in between. Also, the machine was turned on in the pictures, and the DMD looked nice and bright with no missing dots or segments. It did, however, have a credit dot. Further, the machine had legs on it, and looked to be in a different part of the warehouse than the rest of the games. Most of the pins available from the Italian source had only one or two general pictures of the game’s condition, and most had their legs removed and were sitting on the ground in a veritable rouges gallery of pinballs. This Addams seemed like a special case: perhaps a game that was fully setup in the warehouse for potential customers or employees to play as a “showcase” piece. From these twenty pictures of the TAF, I saw a pretty decent cabinet, a bright DMD, an acceptable playfield with minor issues and very little magnet burn of any sort. I sent payment, and waited a month for its arrival. One of the twenty original sales photos provided by our Italian wholesaler for this particular Addams Family. I was nothing short of amazed at the condition the game was in when it finally arrived. It was plug and play (after jumping the game to 110V) has been solid ever since. The credit dot I saw in the pictures was due to a couple of switches that had not been activated for a long period of time. One good play blew the cobwebs out and it was good to go. I came to find that the playfield was waxed at some point recently; however the underside of the game and playfield nooks and crannies had their fair share of black carbon and grime. No rust to speak of on any of the mechanical parts. I did have to rebuild the flippers to add some extra snap and a new set of rubbers were thrown on to replace the ancient ones it arrived with. Another surprise was that a remote battery pack was already installed. My greatest surprise, though, was that there was no funky “container pin smell” of cigarettes and urine in the cab, as many of these games are known to have. If this machine wasn’t in a private collection overseas, it was well maintained by a god-sent operator in some location other than a smoky bar or coffee house. Language was default German, but coined for Italian Lire. My coin door still has three slots, and the serial number sticker still proudly sports its letter “I”. As stated above, I paid $3900CAD for the machine, shipped to my doorstep, which to me, was a good price. I was a successful experience. But would I do it again? Probably not. The chance of disappointment is too great for me to shoulder. This sort of disappointment would probably be lessened if a single buyer (or company) was importing an entire shipping container on their own and could spread out the financing needed to fix up one or two basket cases over the entire load which may contain a few gems. Kind of like a shell game: a hundred dollars of parts on one is covered by a few hundred dollars of profit on another. But the days of retailers being able to bring these machines over in any sort of quantity is behind us, for the most part. The profit just isn’t there anymore. Our European connections can simply check the most times inflated prices of eBay and Boston Pinball and adjust their prices accordingly. The days of getting a Popeye Saves the Earth in a container for $250USD are long, long gone. I have a feeling the European sellers have now tried to target the collectors directly rather than selling to North American distributors. A distributor wouldn’t pay what amounts to $1500USD for a Roadshow with major issues–there just isn’t enough profit to be made after fixing it up. However, a private collector who wants to take on a restoration project might. Finding this collector, or group of collectors, that want a bulk load of thirty-five to seventy machines, with 25% of those being C and D list titles, is tough. 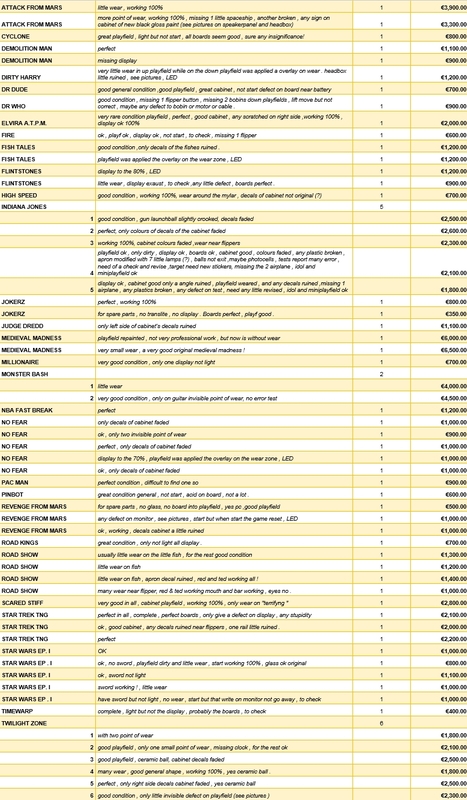 Below is a list of prices for Bally/Williams games from an overseas seller, received in April 2014, just to give you an idea of how much a European wholesaler wants for their games now. The ever-hilarious “invisible wear” description makes a few appearances, as does the title of this article in reference to a Star Trek: The Next Generation, the absolutely eloquent: “Only give a defect on display, any stupidity”. Anyone tempted by the €6000 sight-unseen Medieval Madness with a repainted playfield? Yeah, the one where the paint job is described as “not very professional work”? I didn’t think so. The series of Twilight Zone machines seem reasonable, and look to have enough meat left on the bone to account for near catastrophic damage or a few missing parts. However, the €700 Millionaire and €600 Fire! that is missing a flipper and won’t start definitely shows that Italians have no idea the value of D-list System 11 machines. And really, who does anymore? “Back ten to twenty years ago, I visited the rec.games.pinball newsgroup a lot. It was a different time: the group was smaller, friendlier, and much more polite than, say, Pinside. I forget how it happened, but through RGP got hooked up with a guy from Belgium named Bart. He was just getting into selling container loads of pinballs to guys in the U.S.
Now remember, back around 2000 or so the market was completely different. In Europe, few people wanted games, mostly because space was an issue and they had more local pubs and coffee shops where operators placed games. There really wasn’t a need to have a home pinball and house sizes are generally much smaller in Europe too, so it’s less practical to have games there. Bart was driving around Belgium buying games, and assembling them at a storage place. When he got 72 games (the number that fits–shoe horns really–into a container), he would email me the list and ask if I wanted them. The answer was always “YES!”. 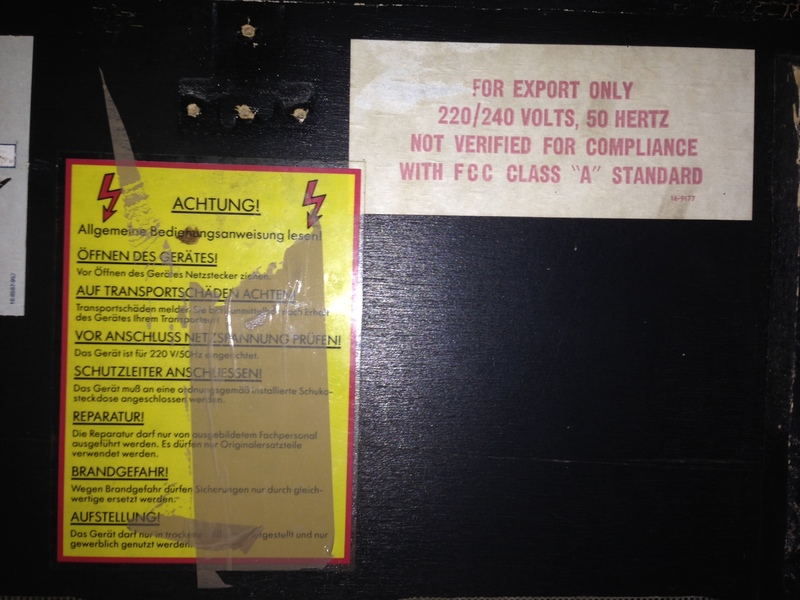 The price for a 72 game container was generally about $15,000 to $20,000USD. Shipping was about $3500 (with about $50 per game added for shipping). At the time, I didn’t have a place to land a full container. That, and you were only given two hours to unload the container, or you got charged heavily. So a loading dock or a fork lift was needed to unload (plus several guys). For this reason my friend Marty was the one that actually bought the container. My “tip” for setting up the deals was that I got ONE FREE GAME and I got to pick the game first right off the container, any game I wanted. Prices for games was cheap. System11 games were generally $100 to $200. WPC games were $200 to $500. The only exception was the Addams Family and Twilight Zone and some other WPC95 games: those were usually $600 to $800. I must of brought in at least eight containers for Marty. And I got eight free games. Good stuff too, like Tales of the Arabian Nights, Champion Pub, Shadow, and other stuff like that. But after eight containers, Bart couldn’t find any more games in Belgium! He said we bought them all. It’s not a big country. Overall the quality of games from Belgium was outstanding. These games were NICE. I then started buying containers from Phil of Pinball Heaven in the U.K. These were usually “half containers” of 36 games, but sometimes full containers, too. But, now I was the one buying them. I still landed the games at Marty’s shop, but then had friends come over to help unload. And they would each haul the games they wanted straight home. I would put the rest in my driveway and sell them quickly (and hope for no rain!) at $100USD over cost. I would keep the titles I wanted and essentially get them for free. The longest it ever took me to sell a container of games was eleven days. The good thing about Phil at Pinball Heaven that was he spoke English and he was a blast to deal with. Also he was VERY picky about his games. If there were any cosmetic problems, he would sell them to me. He wanted low hanging fruit for HIS business, and I got the “junk.” For example, a bunch of Star Trek: The Next Generations for $240 each that had broken ramps. Now remember, Phil is in a different part of the world where parts are harder to find. Pinball Inc wasn’t in business at the time. So any “problem” games with hard to source parts he sold to me. For me, in the US, the STTNG ramps were not a problem source at the time. Then we switched to buying containers from South America. I only did a couple loads from Argentina because now the game quality was starting to get very poor. South America had no parts, so everything was hacked and modified. It was still worth it, but only marginally so. Also, now it was the mid-2000s, and prices were starting to rise. And this is before prices here in the U.S. were very high. I did a couple containers from South America and then stopped. Also, the South American guys weren’t easy to understand and were a lot less fun to deal with than Bart or Phil. “Australia is the biggest island on the planet, so unless it is produced locally it’s got to come into the country by air or sea. When it comes to pinball machines it’s pretty clear which option is the most economic alternative. However, after your freight costs, Customs agent fees, port handling charges, goods & services tax, trucking expenses and the potential of further fees from the Australian Quarantine Inspection Service you can add anywhere from $1000-$2000AUD to the cost of your game. It is at this point that the appeal of importing an entire container begins to look a lot more attractive to the Aussie Pinhead. The per unit cost of bringing pins into the country decreases significantly, however, the initial capital required to import an entire container combined with significant logistic challenges means most of us ultimately put the idea into the “Too Hard” basket. So generally, dealers are the ones importing the majority of containers. A restoration professional who imports a container into the country annually once told me that at any given time, there is always a container of pinball machines on the water coming to Australia. Nearly all those containers are coming from Europe and house games from both the Electromechanical and Solid State eras. Obviously, this doesn’t include the new Stern games that are coming in from the US. While my collection has a number of “Australian Delivered” games, I also have games that were initially sent to Italy, France, Germany and New Zealand. The New Zealand game, a Fish Tales, is odd, as I’ve never heard of anyone importing a container from New Zealand, but it’s made it’s way over here somehow. The biggest bone of contention within the Australian pinball collecting community is “container pin condition”. In a nutshell, opinions are generally formed from personal experience–some say they’ll never buy “trashed beaters” brought in by the container load. But generally Aussie pinheadz know that pins can get equally trashed wherever you are in the world, so if it’s in nice condition – who cares where it comes from. In my experience, the condition of imported games is generally very good. I’ve bought a collector quality Family Guy and Sopranos virtually straight out of a container. But, maybe I’ve just been lucky. Don’t get me wrong I’ve witnessed some disasters where unwitting first time importers have been taken advantage of by an unscrupulous overseas wholesaler who’s dumped a load of “project pins” on them. But the stories of sharks are rare. While the containers that came to North America in the last fifteen years contained mainly Bally-Williams and Data East DMD games as their prize bounties, the Australian’s receive a steady diet of pinball machines from all ages, including Electromechanical and early Solid State titles. That may be a sign of the interests of the Aussies, or perhaps that the collectors down under are hungry for whatever they can get their hands on. For a sampling of the types of machines imported into Australia, an idea of their general condition and their asking prices (in Australian dollars), please check out the blog maintained by Pinball Machines Australia, a retailer outside of Melbourne that regularly posts photos of their container imports. It appears that they clean and refurbish what they can to sell in their showroom and shuffle off the basket cases that require a significant amount of time and work as “AS IS” projects. More insight into what arrives into Australia via container can be gleaned from the Pinheadz Pinball Podcast Episode Three, wherein Mr. Cuddihy tags along with Pinball Memories, another Melbourne-area retailer based in Caroline Springs, as they open a newly-landed container and organize its contents. A container arrives at Pinball Machine Australia, Melbourne. With the worldwide resurgence of pinball, I’m sure overseas wholesalers are having a tough time prying loose merchandise from former operators and collectors to send across the ocean. As Mr. Harrell noted, some countries were completely tapped back in the mid-2000s, so there is bound to be little left. The significant price increase paired with the lower quality “dregs” still available to the wholesaler makes this market almost dead to North Americans. For the Aussies, it obviously remains a viable avenue. Does this have something to do with the Aussies being more adept at “making do”? Anyhow, I’m glad I participated when I did, and added a game to my collection that will probably never leave. I’m happy with it and in the end that’s all that really matters. My refugee re-import Addams Family stands as a container success story among tales of misrepresentation, foul smells, water damage, corrosion, missing parts and a few handfuls of sand. I would like to thank Clay Harrell, Rod Cuddihy, and Adriano Jorge for their contribution to this article. Special thanks to Don Walton, Jr. Extra special thanks to the Credit Dot readership for their patience in what seemed to be a long break between posts. Categories: Feature | Tags: Addams Family, Chris Hutchins, Clay Harrell, Container Pinballs, Corrosion, Doctor Who, High End Pins, Pinheadz Pinball Podcast, Re-Imports, Rod Cuddihy, Rust, This Old Pinball | Permalink.